You are here: Home / Media / Books / How Patriotic is the Patriot Act? 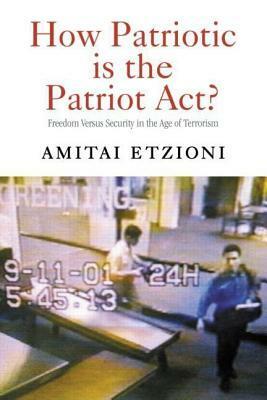 This book provides a comprehensive examination of many of the individual measures contained in the Patriot Act. Etzioni holds these measures to the standard set forth in the 4th Amendment prohibiting unreasonable search and seizures and assesses how reasonable the provisions set forth in the Patriot Act are in a post 9/11 world. "Amitai Etzioni presents a thoughtful assessment of the controversial post 9/11 measures and proposals that undermine civil liberties in the name of national security. Even for those of us who disagree with some of his conclusions, this book provides valuable insights into the essential task of maximizing safety while minimizing invasions of liberty." "This book is very welcome. Dr. Etzioni shows us how to avoid the paired vices anchored in terrorist-induced fear or police state-abetted oppression. it would indeed be cowardly and unpatriotic not to take reason steps against the purveyors of hate, but it would be equally rash to under-appreciate the significance of a rule of law that aspires to advance human dignity. Finding the balance between civil liberty and national security requires wisdom, and this volume orients the public debate toward it." Learn more about this book on Routledge's website.